April 7, 2014, 10:36 a.m.
As a small band of ex-Posties launch the much watched Vox, the paper’s top editor sees better days ahead for many outlets new and old. By Marty Baron @PostBaron April 7, 2014, 10:36 a.m.
Editor’s note: At this weekend’s International Symposium on Online Journalism in Austin, the Saturday afternoon keynote was Marty Baron, executive editor of The Washington Post and one of the country’s most prominent newspaper editors in earlier roles at The Boston Globe and The Miami Herald. 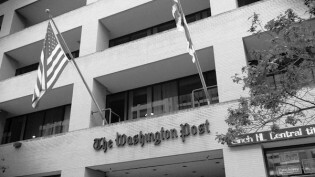 The Post has, like all American newspapers, had a rough decade or so, but its purchase last August by Amazon founder Jeff Bezos opened up a new sense of optimism about its future. In recent weeks, much of the talk about the Post has centered on the defection of Ezra Klein and a handful of other staffers to start Vox, which launched last night to much interest. But despite the outsized chatter that move prompted, Baron told the ISOJ audience he’s optimistic about the future of the Post and the broader news world. I knew that title would be a bit of a risk. Our profession and our business face many problems, many pressures. Optimism is not always easy to find, and sometimes it’s perilous to admit, especially when you’re in the middle of the turmoil, as I have been for 14 years as the editor in chief of a newspaper. He then asked me to define what I meant when I said something was good for journalism: Did I mean it was good for the customer? Did I mean it was good for journalists looking for jobs? Did I mean it was good for existing journalistic institutions like his or mine? I responded that the third one — journalistic institutions — was not relevant. That would have to sort itself out on its own, and it largely depended on what these institutions do on their own behalf. I’ll just note here, because I can’t help myself, that I volunteered the title to this speech well before Internet pioneer Marc Andreesen wrote his now much-cited blog post on how bullish he is about the news business — and before others chimed in with similar thoughts. There may be reason for me to feel particularly optimistic this year. I’ve been, as I said, a top editor for 14 years. And this year is, I’m fairly sure, the first year I haven’t had to cut the budget and to reduce staff. So it’s a good feeling — but, I recognize, not one that’s universally shared by my colleagues at other news organizations. So I don’t want to be Pollyanish, and I don’t think I am. I sounded a similar optimistic tone in a speech to New England editors a year and a half ago, well before I could ever have anticipated the turn of events at The Washington Post. 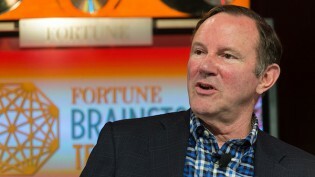 Truth is, I could never have anticipated what has happened at the Post — Don Graham selling us, Jeff Bezos buying. OK, so I’m going to try a device with these remarks that seems popular these days — a list, or listicle as it’s come to be known. This is more list than listicle. So what follows are 9 reasons to be optimistic about journalism. 1. Let’s start with the basics. We’ve survived. We’re still here. Real journalists doing real journalism. Not too long ago, people said The New York Times would go bankrupt. It didn’t. A few years back, The Boston Globe was threatened with a shutdown (and a gleeful critic advised me, its editor at the time, to practice saying “Would you like fries with that?”) The Globe survived to do outstanding work. About 25 years ago, I was at the Los Angeles Times as a senior editor. Ted Turner, founder of CNN, had come to visit — and I was among those invited to a nice lunch. 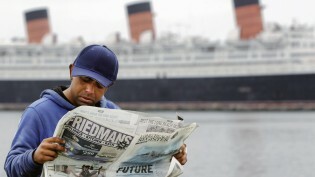 He returned our hospitality with a warning, more accurately a prediction: In 10 years, he said, the Los Angeles Times would be out of business. That would be due, he said, to 24-hour cable news. The L.A. Times has had its struggles, but it’s still very much in business — doing very good work — and its struggles today have had little, if anything, to do with CNN or 24-hour cable news. They’re due to the Internet, which has put pressure on a wide range of industries, not just ours. So, the point is, we as an industry and a profession are more resilient than people give us credit for. More resilient than even we give ourselves credit for. 2. New owners are bringing needed new capital and a range of disparate ideas, rethinking business models. Our new owner at the Post, Jeff Bezos, is among them — investing $250 million in cash in the purchase of the Post and investing millions more into initiatives aimed at growth and digital transformation. Red Sox owner John Henry has acquired The Boston Globe and is obviously rethinking its business model. At the Orange County Register, Aaron Kushner is trying a wholly different approach, emphasizing print and betting that a substantial investment in reporting resources will give the industry the jolt it needs. Warren Buffett and his people are bringing their own ideas about local journalism to newspapers in smaller communities. Minnesota billionaire Glen Taylor has offered to buy the Star Tribune in Minneapolis. We’ll see what he has in mind. You don’t have to believe in any one of these approaches to recognize that we’re in a period of tremendous experimentation with the business models of legacy media organizations. Not all of these will work. My wager is that something will, and then others will follow. The variety of approaches is a big plus. We now have a living laboratory of business model experimentation. And the good thing is that some of these new owners have long-term perspectives. The payoff on experimentation doesn’t have to be immediate. That’s the case at The Washington Post, where our owner has spoken of giving us “runway” for experimentation. We will try a lot of things, and we’ll have time to see if they work. 3. I just spoke about legacy journalism organizations. As important is the blossoming of new journalistic organizations. Some of these have been the creations of people who left legacy organizations to create ventures of their own, staffed solely by web-savvy, digital-era journalists. We recently experienced that at the Post with some staffers going off to form their own venture, funded by Vox Media. The New York Times and The Wall Street Journal have seen similar departures. Capital is now available for journalism entrepreneurship. It doesn’t make my life any easier when people leave, but overall it is healthy for journalism. Media pundits have a habit of viewing these spinoffs as a sign of dysfunction in businesses like ours, a sign of the failings of legacy institutions like mine. In fact, these spinoffs are a sign of health in the industry, just as the availability of capital for entrepreneurial spinoffs in Silicon Valley or here in Austin is a sign of health. But the new competition will translate into enormous innovation — and, I might add, a bounty of jobs. The overall journalism ecosystem is more varied than before. Today’s journalistic organizations have more distinct personalities. They have disparate approaches to informing readers. There is far less uniformity. Our field is more colorful. We are in an era of journalistic entrepreneurship, and journalists will have to be entrepreneurial — building entirely new companies, working within new entrepreneurial ventures, or behaving as internal entrepreneurs to transform organizations that have stood for decades. 4. New forms of storytelling have emerged, and they have proved particularly effective at connecting with readers. They can vary from listicles to data visualization that helps readers process a mass of information as never before. In many instances, the storytelling combines a variety of techniques. New article formats have been developed that ease readers into supporting material, or supplemental material, when they wish to know more. Interactive graphics, videos, and other devices are presented contextually, integrated into stories in appropriate spots. The reader experience is enhanced. Readers are more engaged. And in the end, readers will be more satisfied. 5. The pressures on our industry have forced us to pay keen attention to our customers — readers, viewers, listeners. We always talked about this. We didn’t always practice it. We often imagined that what we ourselves wanted to do was what our customers wanted from us. At the very least, we said it was good for them. Maybe it was. But the fact is, customers were not always consuming what we were feeding them. In some instances, we just assumed they were. We assume that print readership equaled readership of our stories. But, if you ever sat in a coffee shop and watched people back then flip through a newspaper, you might have watched in dismay as they flipped right past your story. Now we can be sure that if our journalism doesn’t connect with readers, viewers, and listeners, someone else will emerge to do it better. There is only one guarantee left in our business, and that is competition. Intense competition. 6. The current conditions in our industry are opening up a vast array of new opportunities. Every year, I am asked by summer interns about job prospects. And I say that, when you look at media defined broadly, we’re seeing an explosion of opportunities. Don’t judge job prospects solely by what’s happening at legacy institutions. New career possibilities have opened up, and young people coming into journalism need to see them and embrace them. By the way, many of those new opportunities do exist within legacy organizations. Their process of digital transformation requires talent with a different set of skills and a more contemporary sensibility about how to connect with readers, viewers, and listeners. These legacy institutions still need strong traditional reporting and writing skills. But while those skills are necessary, they are not sufficient. New recruits need technical skills — perhaps in coding, perhaps in video. More important, they also need an instinctive, or highly developed, sense of how the public is receiving and processing information today. This year in The Washington Post newsroom, we are hiring three dozen people, all with the goal of digital transformation. And we are doing exciting things. Lost in all the focus on change is that some of the most transformative developments in media are taking place at some of the industry’s oldest institutions. 7. We are now seeing a whole new generation of journalists enter our field. They come with the skills required, with the right sensibilities. They can think well, write well. They’re bright, they’re energetic, they’re enthusiastic. They love what journalism can do. They understand its vital role in society. And they appreciate that there are new, highly effective ways to tell stories that need to be part of our daily toolbox. These young journalists are true digital natives. And it shows. Journalists of a previous generation can learn new digital skills. They can adapt. They can work hard and diligently at telling stories in new ways. And they can be really good at it. But digital is not their native language. It’s like those who immigrate to this country as an adult. They can speak perfect, even elegant, English. And yet their accents are unlikely to disappear. These new journalists enter the field without an accent that hints of foreignness to the new medium. Their familiarity with the digital idiom is complete and natural. 8. Perhaps most important: Amid all the turmoil in our field, amid the persistent and pervasive anxiety among journalists, we’re doing strong and important work. We’re continuing to fulfill the journalistic mission. I’ll talk about papers other than my own and other than the biggest ones. Over the past year or so, the Milwaukee Journal-Sentinel disclosed a breakdown in the blood-screening system for newborns, causing delays of days or weeks in treating ailments that require immediate attention. The Sacramento Bee reported on a Las Vegas psychiatric hospital that over 5 years discharged 1,500 patients by putting them on Greyhound buses out of Nevada and bound for other states, where they had no housing, no plans for treatment, and, in some cases, knew no one. Some were violent offenders who went on to commit crimes, including one murder. 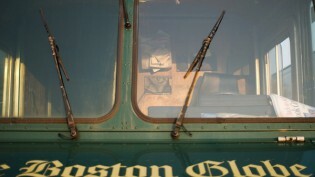 The Boston Globe reported on an abusive system in which the owner of the city’s largest taxi fleet subjected hundreds of drivers to a system of continuous exploitation. Amid all the anxiety in our field, we should not forget the enormous amount of pioneering and profoundly difficult journalism that is produced. Now, I want to make clear, to repeat, that I’m not a Pollyanna. I recently heard the Israeli president, Shimon Peres, describe himself as a “dissatisfied optimist.” That describes me, too. I fully recognize that we face enormous challenges. There are serious, unresolved questions about how investigative reporting will be funded, particularly at the local and state level. There are too few journalists providing the most basic coverage of state and local government, as well as their congressional delegations, not to mention serving as diligent watchdogs of politicians and policy-makers and the people in the private sector who exercise influence over them. Digging takes time and money and, often, expensive lawyers. Understanding of world affairs is weakened when American coverage comes from too few media outlets and too few reporters on the ground. There is no assurance that thoughtful, quality, in-depth journalism — which takes a lot of time — will not give way to gimmicks and click bait that lead only to a lot of social sharing. The business models are unsettled, and digital ad rates are declining, as our product inventory — page views — keeps growing. In short, we have not found the answer, or answers, and we don’t know for sure if there are conclusive answers to be had anytime soon. But in our business, pessimism too often seems to prevail. Today’s experimentation will involve failure. It requires us to try and then try again. People need to realize that. And those of us who are experimenting need not be embarrassed by it. All of you who are entering the profession, or hope to stay in it, need to be smart about this. Do not look at our field through the wrong end of the telescope. Look into the distance and see the genuine opportunities ahead of us. 9. There is no acceptable alternative to optimism. We cannot be successful if we are not optimistic, if we do not recognize opportunities and seize on them. If we are not optimistic, why work to succeed? What use would it be? And if you are not working to succeed, no matter the obstacles, you are not working as you should. So if we hope for a better future, we must be confident that it is within reach, even if it is not within easy reach. And we must keep trying. I believe there are, in fact, ample reasons to be optimistic. I’ve cited some of them for you here today. I’m encouraged. I’m excited. But I also choose to be optimistic because only as an optimist can I envision a route to success. Only through optimism can I have faith that our important journalistic mission will be sustained. That conviction is what carries me to work every day, and what drives me from one day to the next. 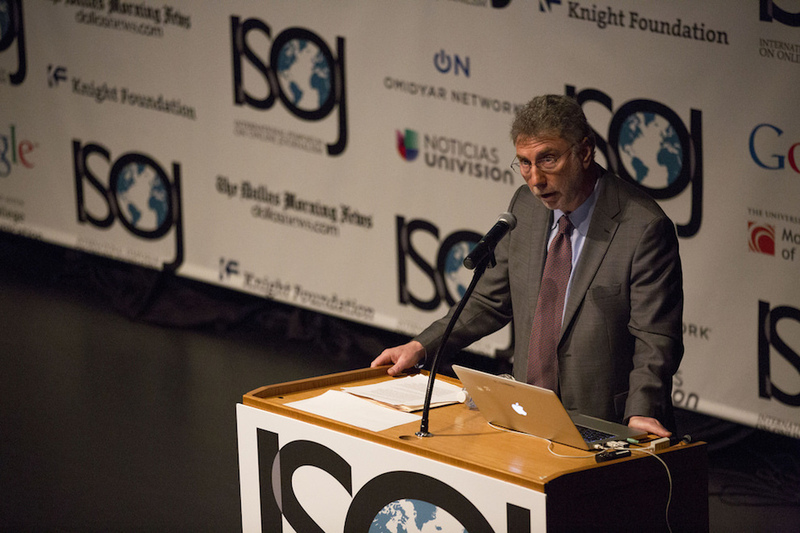 Photo of Baron speaking at ISOJ by Bryan Winter/Knight Center for Journalism in the Americas used under a Creative Commons license. POSTED April 7, 2014, 10:36 a.m.
Baron, Marty. "Optimism is the only option: The Washington Post’s Marty Baron on the state of the news media." Nieman Journalism Lab. Nieman Foundation for Journalism at Harvard, 7 Apr. 2014. Web. 24 Apr. 2019. Baron, Marty. "Optimism is the only option: The Washington Post’s Marty Baron on the state of the news media." Nieman Journalism Lab. Last modified April 7, 2014. Accessed April 24, 2019. https://www.niemanlab.org/2014/04/optimism-is-the-only-option-the-washington-posts-marty-baron-on-the-state-of-the-news-media/.